When commiserating with my husband over books that we read and loved growing up, he has often mentioned the Freddy the Pig series by Walter Brooks. I did not recall having ever read them, so I put it on my To Read list to see what it was that captured the imagination of my husband. Freddy the Pig is a character who lives on the Bean Farm in a series of 26 children's books by Brooks. Freddy is one of many farm animals which are discussed throughout the series, apparently, but he's the one who captures the titles in the series. Freddy Goes to Florida was originally (and more appropriately) titled "To and Again." It is the story of a group of animals from the Bean farm deciding that they are tired of northern winters and collectively decide to travel to Florida for the winter. The only reason I can think of for retitling this book is to include it in the Freddy series. It's not really about Freddy at all. He's a minor character who comes up with little ditties and rhymes which he recites as the animals travel along. Of course, the humans that the animals run into on their journey seem to think nothing of a group of animals migrating together. The animals make the news wherever they go -- including in D.C., where they meet the president and shake his hand. It rather remdinded me of E.B. White's The Trumpet of the Swan wherein people's reaction to odd animal behavior is concerned. I didn't really enjoy that book very much either. It's too unbelievable for me. I ENJOY children's/juvenile fiction. But there are some books that totally lose me. Freddy was one of them. (With apologies to my husband!) I can see how I probably woud have really enjoyed these books had I read them during a time when they were more age-appropriate. But they don't have the charm that still captures my imagination or interest today. I'd say Freddy is a toss-up. He doesn't land on my "Must Own" list but I'll leave it to our kids to decide whether or not they enjoy Freddy. They will probably be a better judge of the pig than I am. I'm on your husband's side, totally!! My 8 year old and I just finished reading this book and last summer we read Freddy Goes to the North Pole (where Freddy was a more featured character--I do agree about his role in this one). when we came upon in an overstock bookstore. I was recently surprised to see that our library has at least six of them, and I'm sure we'll be digging in. I'm going to post a review sometime this week about why I loved reading these with her so much. I'll look forward to your review! BTW, I read The Royal Diaries: Mary Queen of Scots and really enjoyed it. Read a few other Freddy books. I think some of the later ones were better. But he's definitely not as profound as Pooh. Carrie--I never posted my review! I'm working on a composite type thing about older books we've enjoyed (published before 1950). I have to say that maybe Queen of Carrots is right. 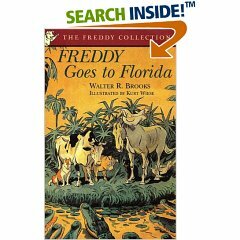 Florida was our second Freddy book, but maybe we enjoyed it so because of the good impression we already had from our first one (Freddy Goes to the North Pole). I'm not sure. Maybe it's just an acquired taste. I just saw the author's comment on your Landon Snow post. Yikes! Don't let that scare you off from writing honest reviews.